Float tanks and people raving about sensory deprivation seems to be all over the media these days. From professional athletes that float, like Steph Curry and the New England Patriots, to comedians Joe Rogan and Duncan Trussell. So what is all the hype about? And if they are that great (which, they are), how can I experience it at home? Sensory deprivation is technically when you “deprive” your senses of all stimulus, such as light, sound, touch, etc. Though this may sound freaky, sensory deprivation is a great way for your body to fully relax, your brain to refresh and for you to take a moment, disconnect and be with yourself. This technique is commonly used in meditation, as it allows easier access to deeper meditative states. As you are probably thinking, it can be very difficult to get total sensory deprivation in today’s world. And that is where a sensory deprivation tank, or a float tank, comes into play. These tanks make it extremely easy to achieve this sensory deprivation. 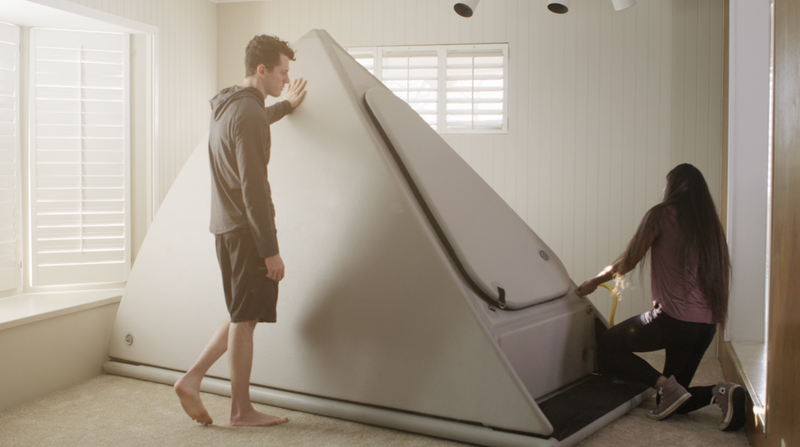 A float tank is basically a giant pod filled with body-temperature, salt-water. The water is supersaturated with epsom salt, so any person can float easily on top of the water. And, because you are in a pod, no light or sound enters, helping to completely remove you from outside stimulation. And with the relief of gravity, your mind and body can relax too. CLICK HERE to learn more about the different types of float tanks. What does it feel like to be in a sensory deprivation tank? At first, heading into a sensory deprivation tank can seem a little scary. A lot of fear can come up around being claustrophobic and getting anxious (even though floating helps with anxiety… but more about that later). But once you get comfortable and are able to relax, being in a sensory deprivation tank is like nothing else. You feel weightless. Not only in your body but also in your mind. There is no pain in your joints or neck or back. Eventually your mind starts to relax too, you reach a state of deep meditation, and it almost feels like you are asleep. It's important to understand first what sensory deprivation does to the body, so you can understand why it has so many positive health benefits. Sensory deprivation from a float tank provides the body with relaxation, relief from pressure + tension, and a chance to heal sore muscles. Float tanks are filled with over almost 1,000 pounds of epsom salt, and the magnesium in the epsom salt helps break down lactic acid that has built up in the muscles. This allows any tightness or soreness to decrease within the body and prompts muscles to relax. Also, you are lying down but fully suspended in water. This takes the pressure from work and gravity off of your body. It allows your spine and joints to be released of any weight that may be pressing down on it. The epsom salt in the tanks also lower cortisol levels. Cortisol is our stress response hormone, and even a slight increase in stress can build up overtime increasing your cortisol levels. When our cortisol levels are too high for too long we start to experience anxiety. And floating actually lowers these cortisol levels, helping you relax. Sensory deprivation and floating have a similar effect on the brain as meditation. But, there is much research specific to floating and the brain thanks to Dr. Feinstein at the Laureate Institute of Brain Research. His work has shown that floating in a sensory deprivation tank can have the same effect on your brain as taking anti-anxiety medication (Schumann). Not only does floating help ease anxiety and panic, but it can also reduce chronic pain in patients suffering from fibromyalgia (Kjellgren, Anette, et al) and patients with severe whiplash (Edebol, Hanna, et al). Though these are very specific studies, floating can reduce pain and tension throughout the entire body. Lastly, many people using floating for their creative endeavors. One study found that floating boosted creativity by assisting one to think more freely. And floating has been used as an effective tool for problem solving, brainstorming new ideas, and learning new information. CLICK HERE to read more about the benefits of floating. How do you achieve sensory deprivation at home? As mentioned above, the easiest way to achieve sensory deprivation is with a float tank because that is exactly what they are designed to do. There are generally two ways to access a float tank. The first is to go to a float center. Believe it or not, there are full-on float spas popping up all over the world. CLICK HERE to find a float center near you. Some of the benefits of going to a center is you will meet like-minded people, and the employees are float experts who will be able to set you up with everything you need for an enjoyable float. However, they can get costly depending on how often you float. Two alternatives to going to a float center are either building or buying a tank for your home. Up until only a few years ago a sensory deprivation tank would cost upwards of $20k to purchase. However, now with Zen Float Tent/Tank you can get started with a floating practice at home for just a few thousand dollars. And if you float enough this will save you money and time. Some more pro’s to having a float tank is you can float at your own convenience, no scheduling necessary. Plus, you can do it from the comfort of your own home. There is also the option to build your own float tank. The founder of Zen Float Co. built his own home tank about 8 years ago.All of his plans to build an at-home float tank can be found online at isolationtankplans.com. This comes with shopping lists, receipts and step-by-step instructions. Confused about what option would be the best for you? Register for a FREE float consultation with one of Zen’s floating experts by clicking the button below. They will be able to answer any questions and come up with a solution of the best floating options for you and your lifestyle. Kjellgren, Anette, et al. Effects of Flotation-REST on Muscle Tension Pain. Karlstad University, Sweden, Nov. 2000. Norlander, Torsten, et al. “Treating Stress-Related Pain with the Flotation Restricted Environmental Stimulation Technique: Are There Differences between Women and Men?”Pain Research & Management : The Journal of the Canadian Pain Society, Pulsus Group Inc, 2009. Norlander, Torsten, et al. “Effects of Flotation REST on Creative Problem Solving and Originality.” Research Gate, Dec. 1998. Schumann, John Henning. “Floating Away Your Anxiety And Stress.” NPR, NPR, 16 Oct. 2017. Seppala, Emma. “20 Scientific Reasons to Start Meditating Today.” Psychology Today, Sussex Publishers, 11 Sept. 2013. Turner, J W, and Thomas H Fine. “Effects of Relaxation Associated with Brief Restricted Environmental Stimulation Therapy (REST) on Plasma Cortisol, ACTH, and LH.”Research Gate, Apr. 1983.